Cape Point is a photographer’s paradise and is one of the most scenically stunning places you will ever visit! Diaz Beach isn’t recommended for swimming, as there aren’t any lifeguards and the weather is extremely fickle at Cape Point. If you wish to go for an awesome beach hike, however, then Diaz Beach is a must-go! You will need to be relatively fit to visit, as the walk down to the beach takes about 20 minutes and double that to get back up. At low tide, you can venture across a rocky shelf and around the bluff on the eastern end of the beach. At the end of the sand, below the cliffs, there is a cave – although it isn’t the most welcoming cave. The benefit of this beach is that it is secluded, very peaceful and extremely beautiful. 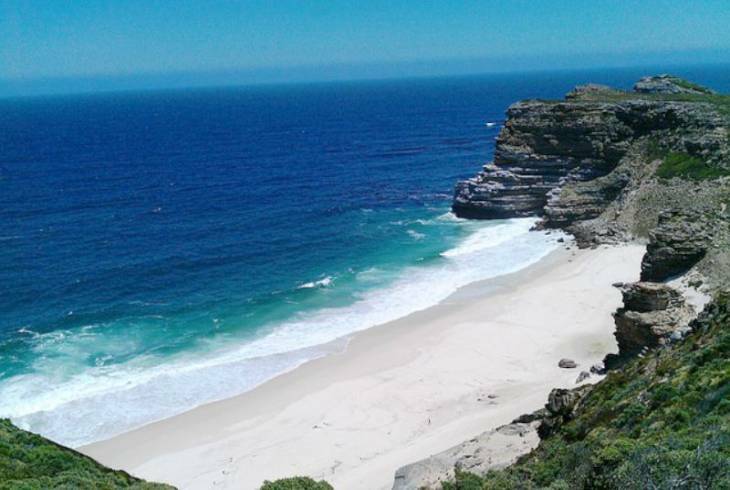 You may even have the entire beach to yourself; apart from the baboons who venture down to the beach from time to time. You will find that the rocks are covered in mussels, but don’t be tempted to take any with you, as this is within the Cape Point Nature Reserve. While you’re visiting the Cape Point, be sure to make a stopover at the Old Post Tree, the Old Power Station Building and Seal Island. There is plenty of accommodation in Diaz Beach, and you will notice that most on offer is self catering accommodation. Diaz Beach, Mossel Bay overview. Diaz Beach, Mossel Bay Accommodation and Information.